September is apple time. Our apple tree is full of little apples this year. And when I think of back to school I always think of apples. Being a first grade teacher, I got my share of this juicy early fall fruit! 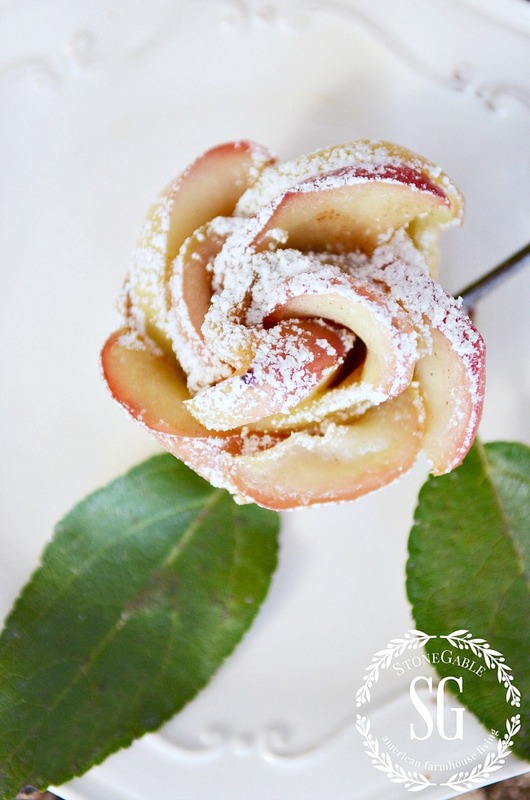 Not only can we eat apples and use them in scrumptious recipes, we can decorate with them too! 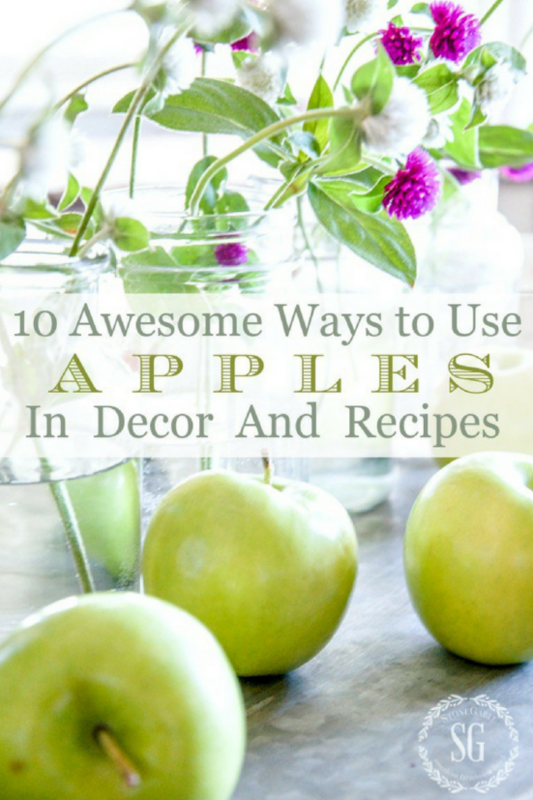 Today I’m sharing 10 Awesome Ways To Use Autumn Apples In Decor And Recipes! Today on Decorating Tips And Tricks we are talking about MAKING YOUR HOME MORE YOU!!! Feeling like your home is an extension of just who you and your family are! Did you know that we have 89 episodes of Decorating Tips And Tricks? All filled with lots of different topics and tips and advice waiting for you? You can listen HERE. 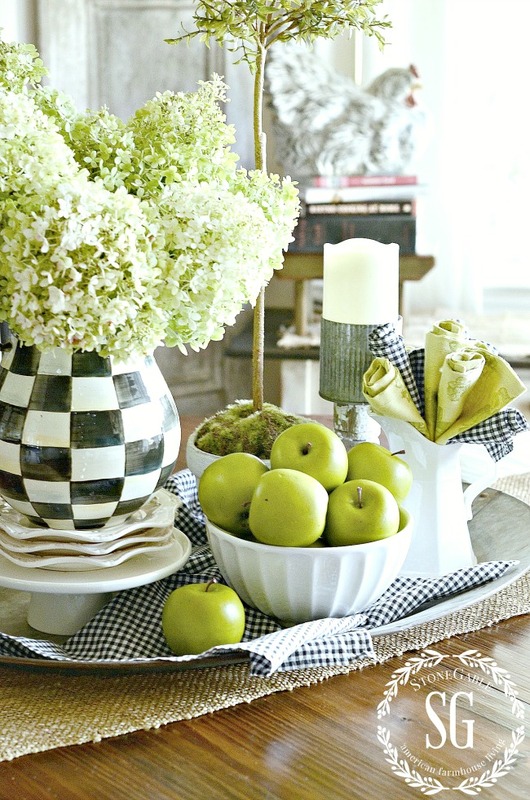 My favorite way to decorate with apples is to use them in a vignette on my kitchen table. They make a colorful fall centerpiece. 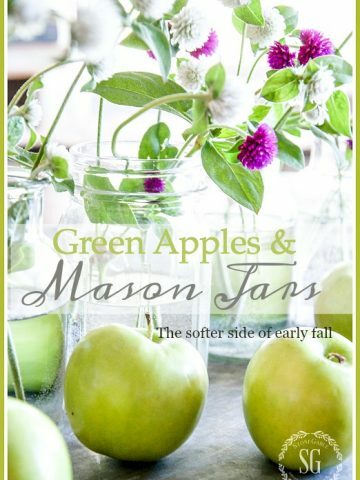 I’m a green apple girl in decor! I think it is because I love green and black and white together! How about you? I bet you could recreate this early fall vignette! After the apples have been in the vignette a little while you can use them in a recipe. I call that a “twofer”! But don’t eat the apples in this vignette… they are fake! I first had this moist absolutely scrumptious cake several decades ago (yes, decades! YIKES!) and I have been making it ever since! The recipe is ridiculously simple and you don’t even have to peel the apples! I love it warm with a scoop of vanilla ice cream. If you make one thing this September make it the raw apple cake! You will thank me for this… you are welcome! I also make raw apple cake in a bundt pan. Oh, Yummy! It is THE BEST! If you have 5 extra minutes you can make this beautiful centerpiece! I ran out to my garden and grabbed some pretty little flowers and put just a few in each mason jar. Then spilled a bag of green apples on to the galvanized tray. So so easy. Do your own take on this centerpiece. How about mason jars with mums or herbs or feathers! I know you might be thinking…” turnovers? They look hard!” Not at all if you make them with puff pastry. I am a self-proclaimed puff pastry queen! I LOVE the stuff! And it elevates everything I use it in! Apple turnovers are flaky on the outside and apple cinnamony and hot on the inside. Oh, my yummy! These are so so easy to make, really! And you can make one for your front door too. Aren’t these so pretty? I serve them alone on a plate with a couple of real apple leaves! The presentation is gorgeous! And again, made with puff pastry! There is a technique to making these but I’m sure you are up for it. Just make sure your apples are not wet or your rosettes will get soggy. They are so worth the care it takes to make them. 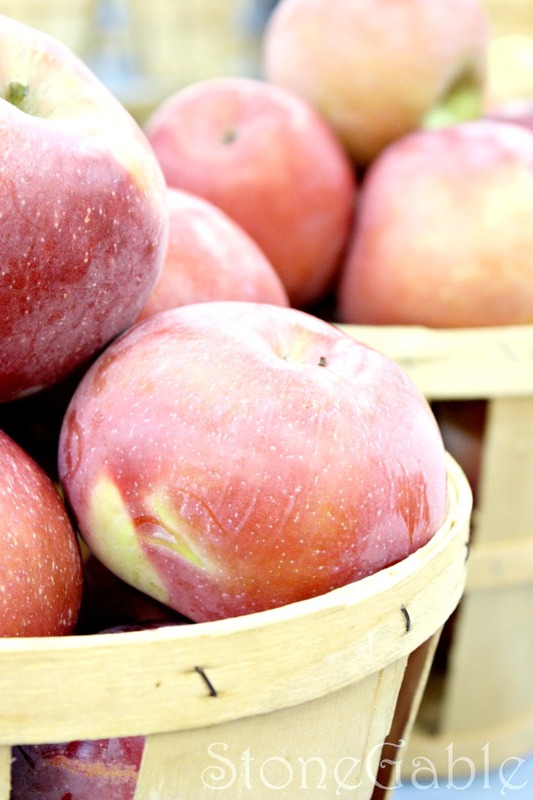 If you want to know about apples… lots of apples… you want to read my apple primer. 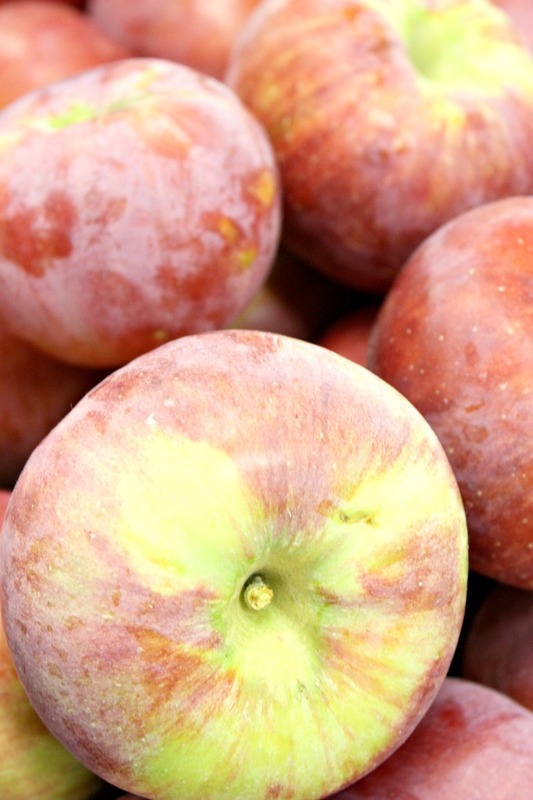 Learn about and how to use the 15 most popular varieties of apples, apple trivia, apple tips, apple quotes, how to store apples and a couple yummy apple recipes. This is the ultimate apple post! I love to core fruits and veggies and put candles in them. And apple candles lined up in a wood bowl all lit up are magical! Even if you are not a crafty girl you can do this! Wouldn’t this look great on an apple themed table? Coffe anyone? How about setting a fun coffee bar on the kitchen table? 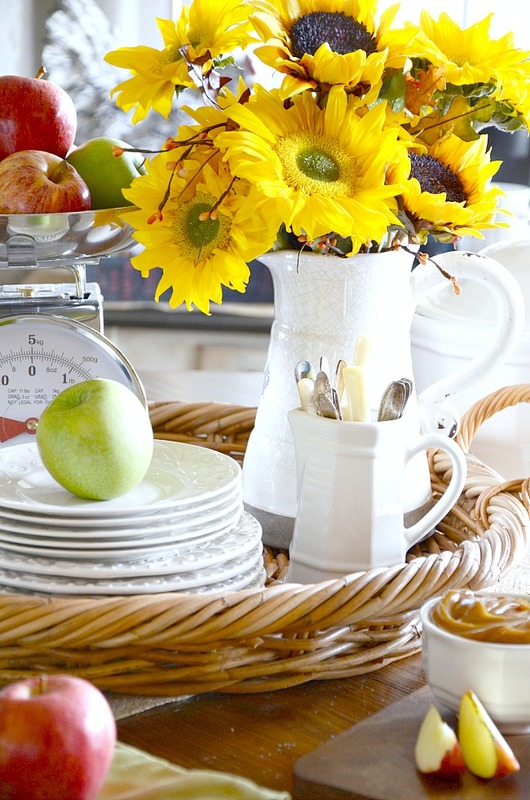 Use sunflowers (and yes, they ARE real!) and apples and other early fall elements! I served a great caramel sauce and cinnamon toast biscotti along with crispy apple slices on this fall coffee bar. Wouldn’t it be fun to invite a few friends over for an apple inspired coffee? When we take our meal outdoors I like to set up the potting bench as a drink station. And fall is the perfect time to serve a big drink dispenser of golden apple punch. Drinks just taste better in cute glass bottles with straws. F U N! Don’t forget to add apples to the dispenser! OKAY, let’s celebrate early summer with A P P L E S! Love all your ideas.Everything looks so pretty and festive. Wish my apple trees produced better! Love all of your apple ideas. I really enjoy your post . I always look forward to them . Thank you for the ideas with apples , I love decorating with natural fruits and vegetables . Love your ideas of using green apples with black and white. FALL fantastic!!!! I just love the apples in the drink dispenser what a fabulous idea. And your sunflower are beautiful. It makes me want to start transitioning in FALL decor. I love the apple ideas…Fall is synonymous with apples for me. Love these ideas! 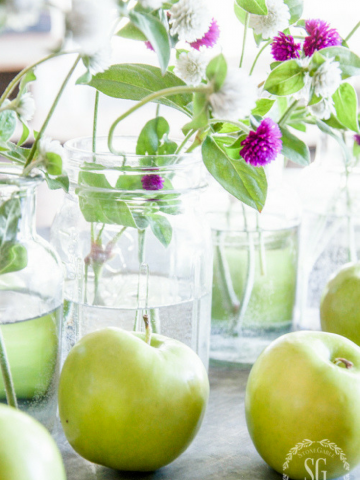 I love the green with black and white too and those sweet purple flowers look great with the apples also. I might have to go buy me some apples! That cake looks yummy! 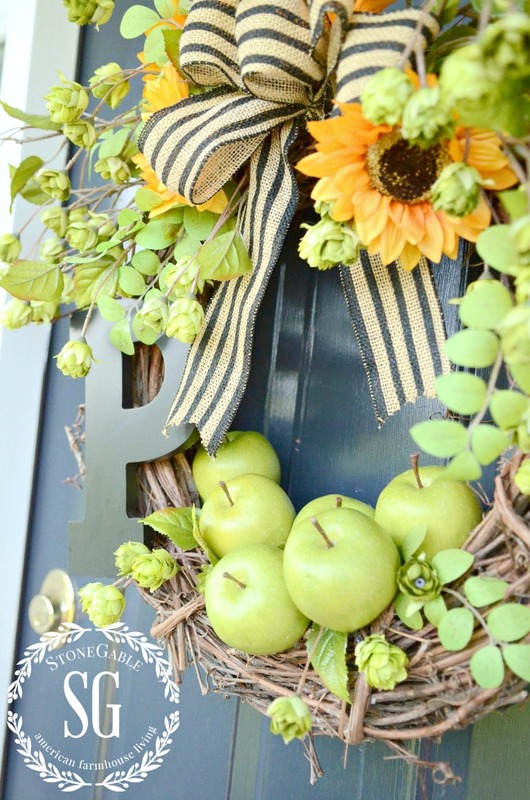 Love your wreath and all your apple ideas! Wonderful ideas and so much inspiration. Thanks for sharing all the wonderful recipes too. I love the green apples with the black and white color scheme. Looks great! Very inspiring Yvonne! I love the ideas that can be pulled together from natural elements in just a few minutes. Also, your new site is great and user friendly! Thanks for sharing. ???? Wonderful collection of apple ideas! Thanks for putting them in one place! 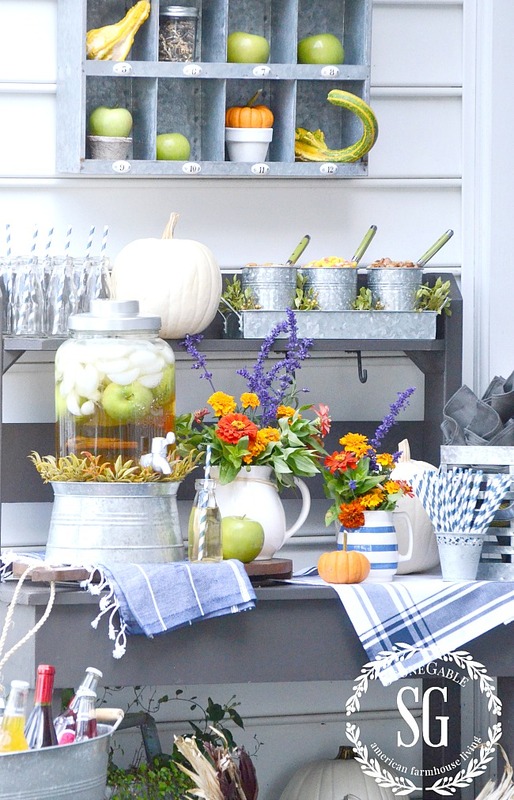 Oh my gosh, how inspiring…love the fall drink bar! Thanks for sharing! You always have the best recipes! I lit my Fall Yankee Candle the other night and it made me hungry for Apple Crisp. BTW I brought your Potato Salad recipe with Bacon & Blue Cheese to a neighborhood cookout and everyone was asking me for the recipe. Not only did I give them a copy of the recipe, I directed them to your website. Thanks for spreading the word Ellie! Have fallen in love with apple green and black and white checks! Such a cheerful combo…love looking at your uses !!! I want to try the raw apple cake! It looks delicious…wonder if mine would ever be as good as yours??? Love this, Yvonne! I have used several of your apple recipes. I can honestly say, none have disappointed me. This is a beautiful post too. Thank you. And I am loving this new blog design! Have a creative day! Loved all the tips. And thank you for the time you spend styling such beautiful pictures! 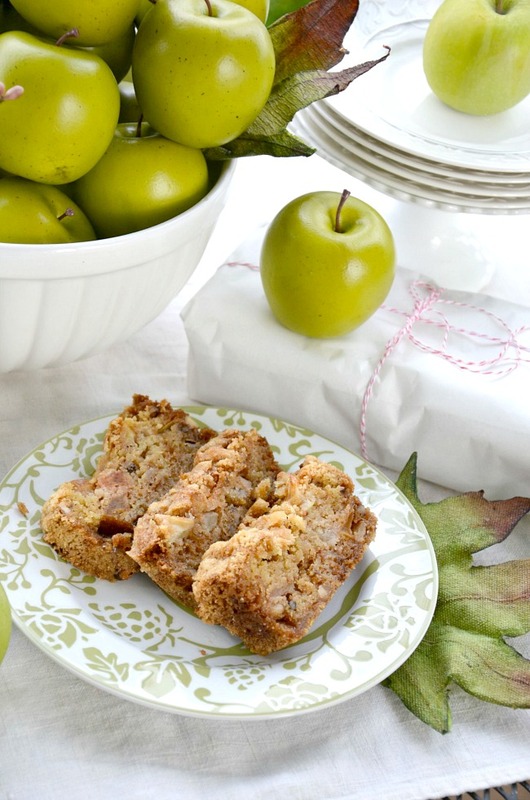 The raw apple cake recipe COULD get me to turn my stove on, rather than just dusting it off! The recipe seems quite easy and very tasty. Ditto to all the comments about loving the apple green, black and white color combination. Do others get nostalgic during the fall season? It brings back so many good memories to me. Time for me to buy some green apples to decorate with before I use them to make the raw apple cake! Love all the ideas! I will definitely be trying several of these, especially the Fall Coffee Bar and the Fall Drink Bar! I love all the suggestions. We don’t drink coffee but I always love the idea of a coffee bar. Perhaps I will make a coffee bar without the coffee. How about a tea bar Rebecca? That would work perfectly! I already noticed the difference in less pop-up advertising. Thank you! Thank you! They were very annoying. Your blog is awesome and I look forward to your daily posts. Keep up the good work! Love, love this post. I’m going to buy apples today! Such great ideas and information on décor and recipes! Love your new look Yvonne…gorgeous! Love all your ideas for apples. 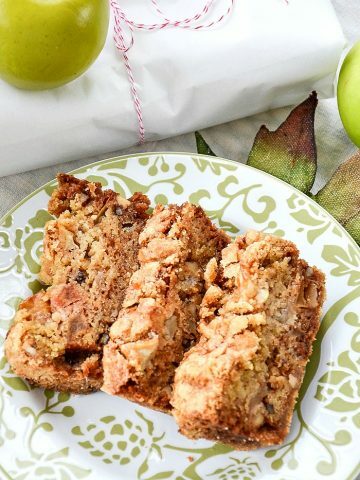 I too make the raw apple cake for family and friends, it is our favorite fall dessert. Have a great day? The black, white, and green vignette is gorgeous. 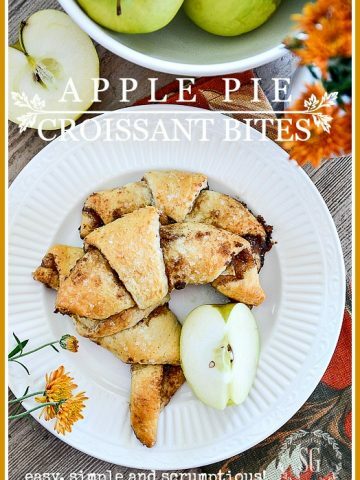 Love all the Apple ideas and recipes! 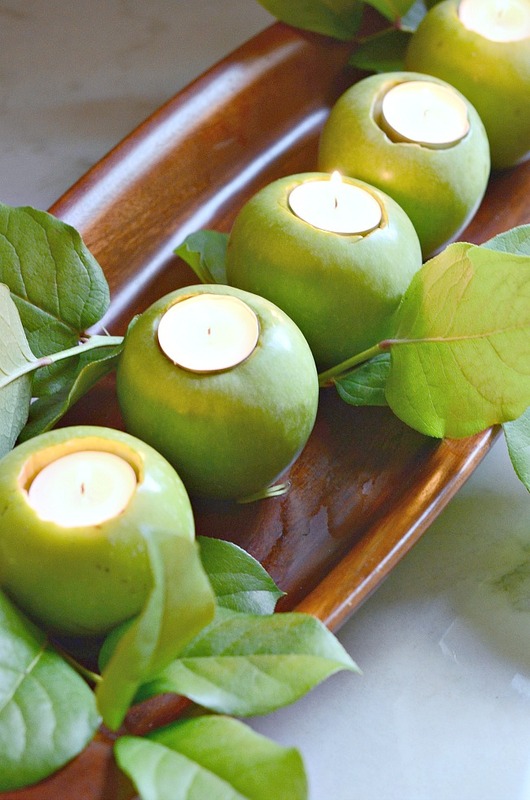 Love the Apple Tea Lights, beautiful change from the ones made with the small Pumpkins. Great apple ideas! I have done the apple centerpiece idea long ago with red apples and pine for Christmas! The recipes sound great also especially the raw apple cake! I definitely will try that one! Thank you! See you likewise are a MacKenzie Child’s fan. Courtly Check looks great with your green apples! Love the wreath also. I agree, I like the green apples with black and white. I love green apple decor. I think I am going to try coring them and using the candles. Yum apples! I love to decorate with them as well. 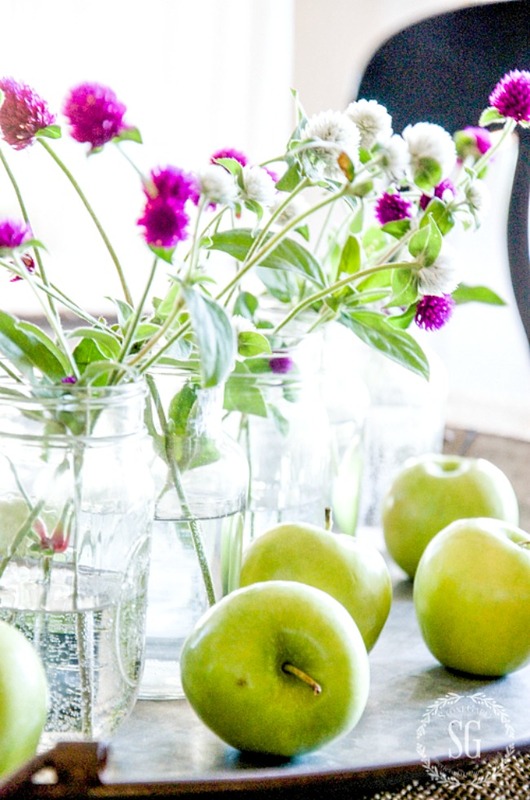 I have faux green apples like you do, and keep them in a vignette on my kitchen table from spring – early Fall (until I get out the pumpkins). I also love the color of apple green with black and white! I need to try the raw apple cake, that looks delicious! As a retired elementary teacher, red apples will always be a part of late August and September for me. Thanks so much for these excellent resources using green apples. Apple cake is on my menu plan for a September family gathering. recently made a cherry slab pie using puff pastry. DELICIOUS ! Nothing says fall like apples. Just this morning I made your recipe for peach tarts in the puff pastry. So easy, so beautiful, and so so, so taste. Wish I had thought to make your chicken salad in puff cups to serve with it for lunch. Anyone you hasn’t tried these recipes should. The apple recipes sound good too. I can attest the raw apple cake is delicious and freezes well. Make two at time when baking this. I love to use apples in my home also. So thanks for the many cute ideas. I can almost smell those apple turnovers. Yum! I read your blog every day even though I don’t comment very often. I love it. I knew I felt a connection to you – I’m a former first grade teacher too! 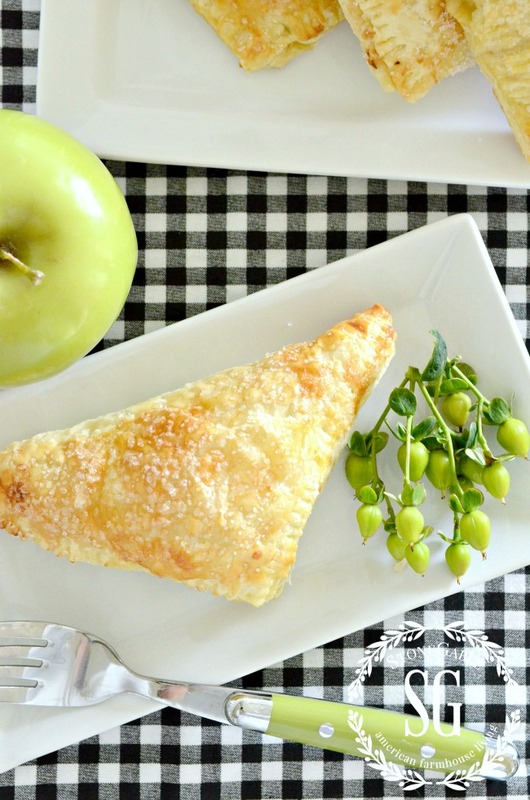 A question – what are the berries on the plate with your apple turnover? They’re so cool. When I was young, there was no puff pastry available. My mother rolled out canned biscuits, added the apple filling, crimped the edges and then fried the turnover in just a little oil. They were wonderful, but I’m going to try your recipe. Apples are one of my favorites to decorate with and eat! You really showed a lot of ideas on how to use apples. I just love your outdoor vignette on your potting bench…beautiful! !